Although there are well over seventy recipes listed in this book, ranging from a simple Dr Martini to Duckling in?Champagne, Barbequed Spae Ribs, Ostrich Egg Sponge Cake, Crêpe Suzette and wine punches to Irish Coffee, making it a pratical reference guide to entertainment at home, Pass me the menu please is not just another cookery book. Eric Bolsmann has, besides listing an array of interesting recipes, traced the history and development of some of the food and drinks commonly found on South African menus. Woven into this historical narrative are hundreds of anecdotes and incidents that make interesting reading and bare mealtime retelling. Answering a host of questions, such as, Who invented the menu? How do bubbles come into champagne, and why is the saucer champagne glass shaped as it is? What nutritional value does caviar have?, to name but a few, and showing that South Africa has contributed considerably to sophisticated eating and drinking as part of her cultural development to gracious living, Pass me the menu please is a must for anyone whose interest in food and drink is not merely a matter of satisfying bodily needs. 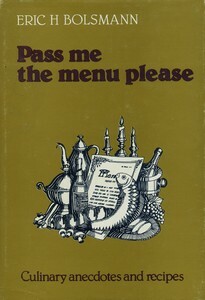 Pass me the menu please was published by HAUM Publishers in?Pretoria as a 172-page hard-cover edition in 1979. The book is a rare collecters item.